This whitepaper will provide a better understanding of the needs for faculty, administration and staff within the academic workplace. Workplaces in academic settings often suffer from disinvestment, crowding and antiquated features—sprouting up in leftover spaces in ever-smaller footprints. Outdated technology and poor support for interaction (either remote or face-to-face) often renders academic workplaces less than ideal for the kind of work expected of today’s employees. 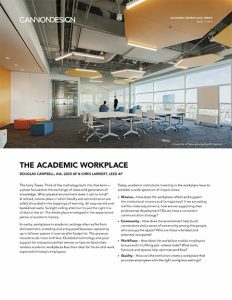 Today’s academic institutions need to consider a wide spectrum of impact areas should they invest in the workplace. This includes how the workplace reflects and supports institutional missions, what tools, furniture and spaces best enable employees to succeed, and how to rationalize spending towards the enhancement of the workplace.